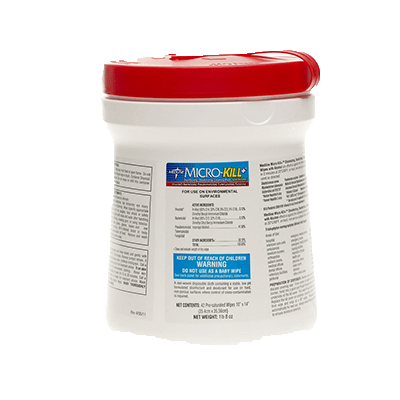 Medline’s Micro-Kill Sanitation Wipes MSC351201 are an effective bleach-free and alcohol-free disinfectant cleaner with a fresh clean scent. Even without bleach or alcohol, Medline Micro-Kill can achieve disinfection of Tuberculosis and other difficult to kill organisms. The MSC351201 Wipes are intended for use on most hard, non-porous surfaces; and the alcohol-free formula is safe to use on most thin plastics, electrical cords and other surfaces typically harmed by alcohol-based products. The non-fuming, light pleasant fragrance is ideal to use around patients that are on oxygen or sensitive to harsh odors. For more information on Medline’s Micro-Kill Sanitation Wipes MSC351201, please visit www.medline.com. Medline is a leader in protective apparel with the broadest product line and low acquisition costs. If high costs are plaguing your facility, Medline can offer you solutions to bring those costs under control without sacrificing the protection of your caregivers. Our protective apparel line includes generously sized footwear, protective headwear, gowns that meet AAMI PB70 requirements, protective multi-purpose gowns, a full range of protective coveralls and comfortable, colorful lab coats and lab jackets. We know you rely on disposable apparel to keep your staff protected and comfortable. For this reason, we use the finest materials available for protection, offering the greatest level of comfort. We apply the highest quality standards to our products and in our manufacturing facilities.